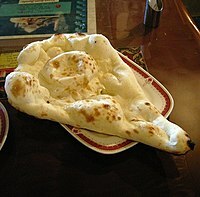 Naan is a round flatbread made with white flour and is a staple accompaniment to hot meals in central and southern Asia. Knead the dough by combining all the ingredients and sufficient water (this will be approximately 3/4 cup but some judgement is required). Wrap the dough in a damp muslin cloth and leave it to rise for 2-3 hours. Roll out the balls in oblong or round shape with a rolling pin or by slapping and stretching with your hands. Smear the surface with water and bake in a tandoor or preheated oven (as hot as your oven will go). The naans should puff up a little, and be ready to remove from the oven in 4 to 5 minutes. Brush the naan with butter. Serve hot. Preheat the oven to 140C/275F/Gas 1. In a small bowl, mix the yeast with one tablespoon of warm water. Stir in the sugar and leave it in a warm place for five minutes until the yeast is covered with froth. This will show that the yeast is ready to use. Mix together the flour, onion seeds, salt and baking powder. Stir in the oil, yoghurt and milk, then stir in the activated yeast mixture. To knead the dough, clench your hand into a fist, wet your knuckles with a little water, then press them repeatedly into the dough. Continue pressing and kneading until you have a soft, pliable dough. It should take about 10 minutes. Leave to rest for 10 minutes and then knead again for another 5 minutes. Place the dough in a mixing bowl, cover it with cling film and leave it in a warm place to rise for 20-30 minutes. Divide the dough into four balls and place on a floured surface or board. Roll each into a long oval shape about 0.5cm (¼ inch) thick. Place them on a greased baking tray and put them in the centre of the oven for 10-15 minutes. They are ready when they have puffed up a little. Serve fresh from the oven. To add an extra crispy finish, pop the baked naans under a preheated grill for 30 seconds before brushing with butter and serving. To add extra flavour, consider adding finely chopped garlic and coriander to the butter you brush over your cooked naan breads. Then return them to the oven (or place under a grill) for a short time to cook the garlic. This page was last edited on 12 August 2017, at 05:23.